Light and compact portable make-up studio. The lit-up case with trolley for makeup artist VPET weighs only 11.5 kg, it is compact and it is the optimal solution for makeup artists and hairdressers working in an itinerant way. Wide lighted mirror provided with I-light Cantoni exclusive system: the led lights grant you 100.000 working hours, no need of any bulb. Perfect intensity, colours and positioning of the lights for the make-up works (no shades, no shadows). Made in Italy, high quality, spare parts available for years. 2 removable trays to keep the content safe. When hung to the sides of the case, the trays work as wide support to place object and tools. the print of your logo (the logo will be marked in white on the lid or/and on the mirror): choose the option, complete the order and then send us an email with your logo. We recommend to send it to us only in vector format (.AI or .PDF, only 1 path). The logo in another format can not be printed. 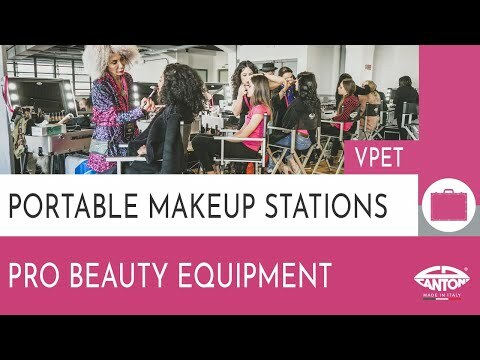 The VPET is a mobile makeup and hair-styling station, turning in seconds from trolley case to a lit-up professional beauty consolle, so light and manoeuvrable to be the perfect solution for makeup and hair styling services on the move. We highly recommend the travel bag to protect the make-up station and the accessories (brush-holder and the bookrest accessories to optimize the spaces.